Orange County Mayor Teresa Jacobs testified before the U.S. Senate Foreign Relations Subcommittee on Western Hemisphere, Transnational Crime, Civilian Security, Democracy, Human Rights, and Global Women’s Issues on May 26 as a key witness on the heroin epidemic sweeping the nation and Central Florida. 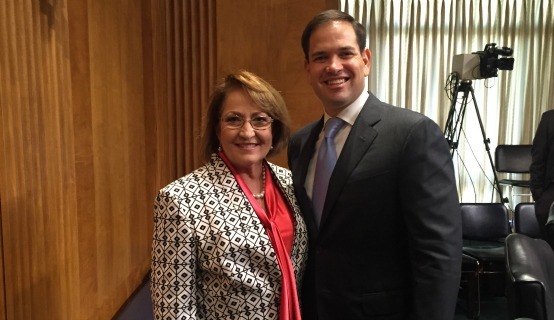 Sen. Marco Rubio, R-Fla., chairman of the subcommittee, invited Mayor Jacobs to testify at the hearing regarding the devastating impact of heroin abuse and overdoses in Orange County. Mayor Jacobs closed her testimony by urging the Senate to work together to stop the influx of drugs from across the border. Mayor Jacobs added that there should be avenues for the uninsured to receive treatment for heroin and other drug related addictions. In March, Mayor Jacobs testified before the U.S. House of Representatives Committee on Oversight and Government Reform on the growing heroin epidemic. Florida Congressman John L. Mica conducted the National Oversight Committee Hearing. Mayor Jacobs formed Orange County’s Heroin Task Force in July 2015 and invited Orange County Sheriff Jerry L. Demings to serve as co-chair. The task force concluded its efforts in March, delivering 37 targeted recommendations, from increased bond and trafficking penalties to social media campaigns warning young people about the deadly nature of heroin, as well as additional education, training and treatment to fight the addiction. In addition to working with Central Florida legislators to gain passage of HB 1241, which allows non-prescription access to the overdose-reversing drug Naloxone, the task force will be rolling out an anti-heroin social media campaign later this summer. For information about the Orange County Heroin Task Force, please visit www.ocfl.net/heroin.